Is there room enough on Division Street for trees and sidewalk cafes too? "Our office is continuing to get requests to remove tree pit fences to allow for more sidewalk cafe space," 1st Ward chief of staff Raymond Valadez says. "We need to meet as a community to discuss sidewalk cafe regulations in general and to come to a consensus on what is acceptable regarding these tree pit fences on Division Street." 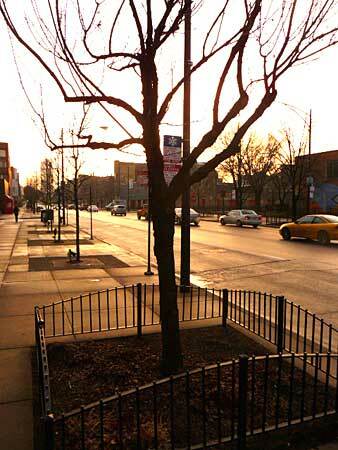 Sidewalk cafe standards are on the agenda at a 10 am Feb. 28 meeting that Ald. Proco Joe Moreno has called with chamber officials, business owners, community representatives and city officials. The session is at the Bedford restaurant, 1612 W. Division St.
"I think we should propose that businesses that use the sidewalk be charged with the care, maintenance and replacement when necessary of similar-sized trees," says East Village Association vice president Neal McKnight. "This is not a bargaining chip: This should have been this way from the beginning." Fences designed to protect the trees have been removed ad hoc in recent years to clear the sidewalk for seating at the Boundary, Moonshine, Prasino and Via Carducci, while other fences have fallen into disrepair. In some cases roots have been paved over with bricks or concrete, starving trees of air, water and nutrients. "The trees are one of the things that make Division Street so desirable for businesses and their patrons," says EVA planning co-chair Scott Rappe. "Expanding the cafe into the fenced area threatens the health of the trees, and puts private profits over the public good."